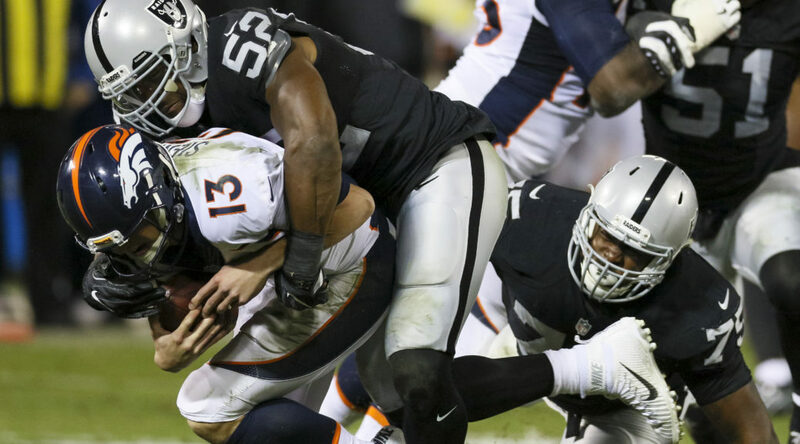 ALAMEDA, Calif. – Oakland Raiders DE Khalil Mack was named the Associated Press Defensive Player of the Year, the National Football League announced Saturday at the Sixth Annual NFL Honors from the Wortham Theater Center in Houston, Texas. The honor marks the second time in franchise history that a Raider has won the award, as Mack joins CB Lester Hayes, who won the award in 1980. Mack was also named the Pro Football Writers of America’s Defensive Player of the Year last month. This season, Mack finished with 77 tackles (56 solo), 11 sacks, five forced fumbles, three fumble recoveries, one interception returned for a touchdown and four passes defensed on the way to earning his second consecutive Pro Bowl selection. Mack was also named to the Associated Press All-Pro Team and the PFWA All-NFL Team this year. The third-year pro turned in another outstanding campaign, dominating opposing offenses in both the run and passing game. He was named the AFC Defensive Player of the Month in November after posting 13 tackles, four sacks, two forced fumbles, two fumble recoveries, one interception and two passes defensed, helping the Raiders go 3-0 in November. He also earned two AFC Defensive Player of the Week Awards (Week 9 vs. Denver and Week 12 vs. Carolina), while becoming the first player since 2009 to record a sack, interception returned for a touchdown, forced fumble and fumble recovery in the same game when he accomplished the feat in Week 12 against the Carolina Panthers.